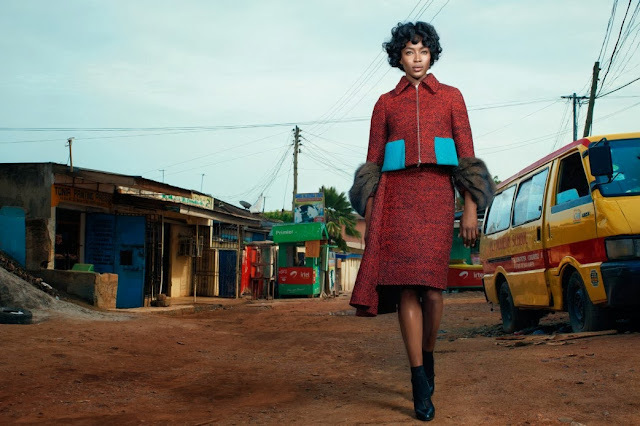 It's in Accra, Ghana that Naomi Campbell channels a stylish First Lady for the W's Global Style Issue this November. For a spread called "Naomi Campbell: The First Lady of Fashion," Campbell took a FLOTUS-worthy wardrobe on a diplomatic mission, borrowing her graceful look from Michelle Obama maybe. "It's a tribute to a modern day First Lady on a state trip, evoking the kind of timeless style that could have existed in the 1940's, 60's, or even today,"says Ghana-born British fashion stylist and style director of W magazine Edward Enninful. We are particularly gasping over the earthy red Prada jacket with aqua patch pockets and matching skirt Campbell is rocking while walking the streets of the old town. It's a bit of an oxymoron merging class to poverty, however the strong colors beautify the concept leading to a feeling of hope and pride!